Lucky to return to diving on Sunday however was thrown right into it and ended up having to do a kit exchange with Charlene. I panicked a bit but managed to get through it. I also was shown the skills by Tania and Sass which seemed to be a lot of skills to have to learn which got me a little worried. We also got to meet a new student who was doing the PADI Divemaster this week – she seems very nice but she had signed herself up for a lot of work. On Monday I had my first dive as a leader ! I was lucky in that I didn’t mess up the navigation and we ended up getting to trumpet fish cave ok! Killed a lot of urchins and saw a baby cuttlefish and a very big pink dentex fish followed us around the urchin patches. This was followed later by practicing the skills with Charlene and Simon. They were both really good and I felt quite far behind and I also struggled a bit with the mask skills- but practice makes perfect so hopefully I’ll get it eventually ! Tuesday was more practice as well as completing the search and recovery part of the course , I was buddies with Charlene and we found our item quite quickly whereas the boys were taking a while to find their item. Simon’s equipment was malfunctioning all over as well so we didn’t spend too much time in the water. We were also taught how to tie a bow line knot and inflate and use a recovery bag lift. 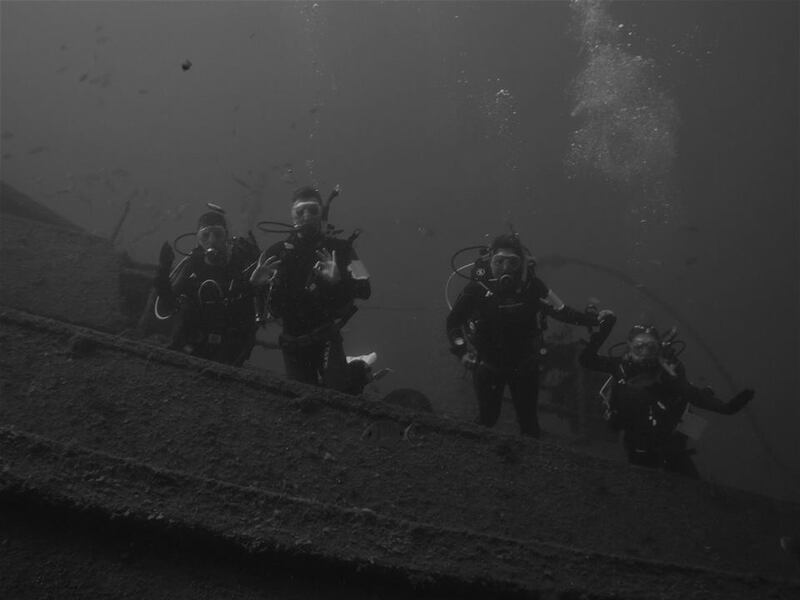 Wednesday was Charlene’s birthday so we got to head out on a wreck dive to Tabaiba. It was quite deep but really fun to get to do a dive in a new place. Dominic apparently saw a huge stingray and there were really big starfish there too! We took some fun pictures underwater too. Afterwards we came back to Abades for the afternoon and did the 100m tow. We also went and practiced skills for a little while and I got a really good hover while Simon and I were waiting for Charlene to come join us. Thursday was skills practice with Laura down with us at the bottom to tell us what we were doing wrong – I was just having a really back day of it and so didn’t get a lot of good positive feedback on the skills. I later went on a dive with Dominic and Stanislav to trumpet fish cave and was hoping to do the three 20 minute dives but only ended up doing two dives because I had taken only a 12 tank and we went out quite far. Managed to get back fine though and had 70 bars left so it wasn’t too bad. My briefing is getting better and so are my skills so I think/hope that I’ll be better with next weeks practices! Previous PostEnjoying the aquatic life of Tenerife Next PostPADI Divemaster almost finished…….